R/C Monster Motorsports, Inc. was established in 2004. Fred Reep, Owner and President of R/C Monster Motorsports, Inc. has been passionate about R/C monster truck racing for over 20 years. Click here to view a timeline of our achievements. R/C Monster Motorsports ties the relationships between the real monster trucks and their R/C counterparts. R/C Monster Motorsports Inc. is a professional, family oriented, mobile radio controlled monster truck racing company. R/C Monster Motorsports can hold races in almost any location including but not limited to: shopping center parking lots, hobby stores, racing events, automotive dealers and schools. We provide all our own audio/visual supplies, track equipment, tents, advertising and awards. R/C Monster Motorsports, Inc. races are a wonderful marketing tool for drawing in large audiences into events. Most of R/C Monster Motorsports events are held within the state of Florida however, we have held races in both New York and North Carolina. 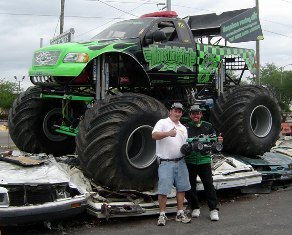 R/C Monster Motorsports has several relationships with real monster truck racing teams. We can work with these teams to set up displays and car crushes at promotional events.